American company Retro Instruments are best known for having recreated the classic Sta-Level and 176 valve compressors in rackmount form. 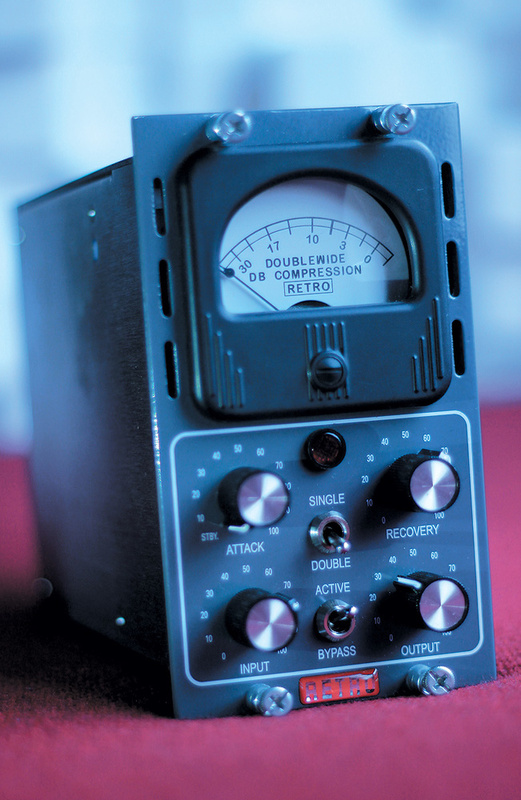 Their new Doublewide does not recreate a specific vintage design, but is a true variable-mu valve compressor (ie. it uses valves as gain-reduction elements, not merely for make-up gain). What’s more, it has been designed from the ground up to work within the technical and physical constraints of the increasingly popular 500-series format. The format presents designers of tube gear with some tricky challenges, not only because of the space available, but also the power demands of most valve designs — so it’s perfectly forgivable that despite being a mono device, it occupies two module slots. The Doublewide both looks and feels great. The controls and switches are all reassuringly solid and clunky, and the simple, bold layout makes it one of the best-looking 500-series units I’ve seen. A fixed threshold and ratio mean you must broadly control the amount of compression desired by juggling the input and output levels. You do, however, have direct control over the ‘attack’ and ‘recovery’ times, and the characteristic or ‘vibe’ of the compression can be switched between ‘single’ or ‘double’. Retro describe the double setting as more dynamic, with faster attack and recovery times, whilst the single setting has a slower, smoother characteristic. Apart from a bypass switch, these are all the controls you get, and there’s no option to switch the VU meter to display the input or output level instead of gain reduction. Starting with a female vocal on a slower-tempo track, I was immediately impressed by the compressor’s transparency: my 500-series modules are positioned out of sight when looking at the computer monitors, and when I turned my head to see how much gain reduction was being applied, I did a double take! The Doublewide was compressing upward of 15-20 dB without any noticeable artifacts whatsoever! Experimenting with a few other styles, I found that flicking between the single and double settings complemented my tweaking of the attack and recovery controls quite nicely. There was a clear difference between those two options, and I almost always preferred the double setting, as its faster recovery times seemed to suit most things I threw at in its direction: it had something to offer each of the three or four different vocals I used it on, and the slower material in particular benefited enormously from its rich smoothing effect. Valve compressors are often used on electric bass guitar, and the Doublewide excelled in this application. I was struck by its ability to smooth out a bass line in a seemingly effortless way, even when applying substantial amounts of gain reduction. I also enjoyed the results when I used the unit for just a whisker of control on a few electric guitar parts. I began to notice that, as well as rounding off the edges and generally ‘holding things down’, the Doublewide was imparting some pleasing valve coloration when I drove the input level a little harder and backed off the output level accordingly. Retro proudly claim that the Doublewide “delivers the tube compression sound you expect by having four actual variable-mu valves under the hood”. And they’re right — which is no mean feat considering the space limitations of the 500-series racks and the traditional physical size of valve processors. Retro also describe the Doublewide as being optimised for slower settings, which fits pretty well with my own experience — it was on such sources that I thought this device excelled (namely smoothing vocals and controlling bass tracks). But the Doublewide is not a one-trick pony: I also achieved great results on electric guitar, and when called upon to crush a drum-room mic signal on one particular track, it acquitted itself well. Pairing the Doublewide with a faster 1176-style compressor to form a classic slow/fast compression produced seriously impressive results when a track suited a more ‘pinned down’ compressed vocal with plenty of colour and attitude. Over the all-too-brief review period, I formed the impression that this processor would really come into its own after you’ve had plenty of time to play with it and become acquainted with the finer details of its performance on different sources. Indeed, this style of compression might seem slightly unusual at first if you’re used to using more aggressive-sounding modern designs. I’m not sure I’d recommend it as your one and only outboard compressor, but if you’re looking to add another compression style to your outboard armoury — and want a taste of what the classic valve designs can offer — then the Retro Doublewide 500 is well worthy of serious consideration.